Well, it’s time to quickly talk about season 3 of Attack on Titan. The season isn’t quite over as it’s on the mid-season break but my journey with it likely is. This season finally crossed the TV-14 threshold and Toonami bumped it up to TV-MA. Now, this might not be for all episodes, possibly just one or two here and there, but it was still a pretty solid jumping off point. TV ratings have always been a little all over the place as sometimes shows just keep whatever rating they got for a while even if the individual episodes don’t deserve it. You see this frequently with many shows on Toonami. There’s less effort put into the ratings than if it were a movie as I suppose they think the fans will just keep on watching anyway. If you know that lets say one episode of Black Clover coming up will be TV-14 you might as well give the rating to all of the episodes or a good chunk of them. Sometimes they’ll update the rating other times they won’t. So for Titan it may end up sticking to TV-14 most of the time or once they go to MA they may not bother switching it back for a while. The ratings can be a bit arbitrary but either way I don’t watch any TV-MA episodes on principle. It’s a guideline that I’ve always stuck to. Anyway I doubt I’m missing much since this show was never all that good. From the few episodes I did see the show was off to a terrible start anyway. The heroes are torturing their prisoners now to get information. Their desperation to come out on top has ultimately made them into the villains they were trying to stop. That’s a common theme within the series as the characters constantly justify their actions or throw themselves a pity party. None of them stay heroic by the end so you probably end up rooting for the ones who are less corrupt than the others. As most of the characters know what the others are doing and still do nothing, there aren’t too many innocents around. It’s a shame but the character cast certainly isn’t going to be holding you on to the hype. This arc deals with the political struggles within the walls for the majority of the season. The government is trying to regain control while the Survey Corps are starting to wonder if they should be in charge. Then of course you’ve got the Titan shifters who have some kind of plan in mind to recapture Eren once more and of course Kenny has been hired to help get Eren for the government. With nobody to trust and everyone showing up as villains it’s a pretty sticky situation for all parties involved. If you enjoyed the Titan battles of previous seasons then you’ll be disappointed as there isn’t much fighting here. You have the huge oversized titan but that’s barely even a fight. No worries as part 2 of season 3 will bring the action back if you’ve made it that long. The negatives are basically the same as in all of the other seasons. The violence is still wildly over the top. The series thrives on being as depressing and dark as possible with everyone not wanting to die before they finally do. The characters are constantly whining and collateral damage to the civilians is always to be expected. Whole towns will be used as bait by the “heroes.” I don’t recall as much animal violence here as in season 2 which is nice even if it’s not enough to save the series. Historia’s backstory is definitely pretty dark and it makes her decision to listen to the father seem rather terrible even from the start. Sometimes it really does seem like Eren is the only reasonable character in the series. I will give the series props for its tight animation and soundtrack as always though. A lot of budget is clearly put into this series and it always delivers time after time. It’s just a shame since the series could do so much more with itself. Put this creative team in front of another big title like a Black Cat reboot and it would be nice to see. On a technical level you just can’t fault this series. 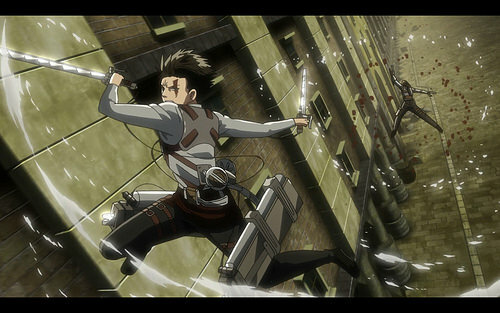 I dare say that they increased the speed even more on the zip lining through the city scenes like when Levi tries to escape the government agents. I’m sure those scenes took a lot of work to create. Naturally this review is a little on the shorter side since I didn’t watch much. The episodes I did see didn’t have much going on so it’s not like there is too much new content to discuss. I do have to say that seeing Eren get kidnapped is always iffy since with his titan powers I’d like to see him be more prepared for these attempts. Summon a little armor at all times or something like that. I think with enough practice he would be able to use such a skill and then he’s really be nice and overpowered. The government agents would stop messing with him at that point. Overall, By this point you will likely know if you like Attack on Titan or not. It’s not as if the series has changed since season 1. It’s still the same characters fighting Titans even if their situations have grown more complicated. The writing style has not changed nor has the animation or the soundtrack. It’s a very familiar series that you’ll have nostalgia for as soon as you watch the first episode. Whether good or bad memories surface from this is another question entirely. I fully expect that we will get a season 4 once season 3 ends and the series isn’t going anywhere anytime soon. 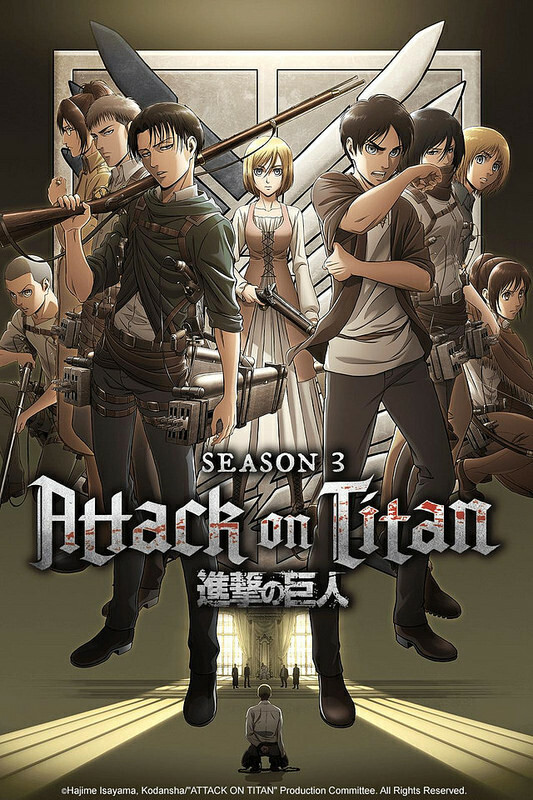 With the manga possibly ending relatively soon (2 years or so) the anime will probably have a finishing point by around season 5 but you really never know. In the meantime I’ll be content with my quality action shows like Dragon Ball Super and RWBY.